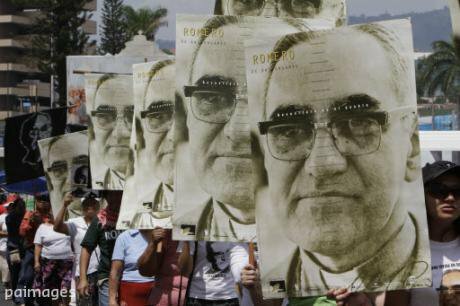 In this March 24, 2011 file photo, protesters carry portraits of slain Archbishop Oscar Arnulfo Romero on the 31st anniversary of his death in San Salvador, El Salvador. (AP Photo/Luis Romero. File)Four of the five judges of the Constitutional Chamber of the Supreme Court of Justice of El Salvador are declaring the 1993 law unconstitutional due to it being "contrary to the right of access to justice, judicial protection or protection of fundamental rights". They also argue that the amnesty law violates the "right of victims to full compensation for crimes against humanity and war crimes constituting serious violations of international humanitarian law". The Chamber is nullifying the law because it violates two articles of the Salvadoran Constitution which are linked to the American Convention on Human Rights and the Protocol II of 1977 additional to the Geneva Conventions of 12 August 1949 related to the protection of victims of non-international armed conflicts. To Belarmino Jaime's mind, the judge who voted in the minority, amnesty was the price paid to end the armed conflict. The verdict of his colleagues, he says, reopens 32 cases, included in the report of the Truth Commission, for prosecution, which conflicts with principles of legality, non-retroactivity of laws, legal certainty and the prohibition of double jeopardy. Jaime considers that the four judges are exceeding the limits of competence granted to the Chamber by the Constitution.What is clear is that the ruling of the Constitutional Chamber broke the dam of silence. Controversy is now coming thick and fast. The Truth Commission's report "From Madness to Hope: The Twelve Year War in El Salvador" was published on the 15th of March, 1993, 26 months after the signing of the Chapultepec Accords. The report stated that over 75,000 people were tortured, extrajudicially executed or disappeared during the war. State agents, paramilitary groups and death squads are responsible for 90% of crimes and 3.3% are attributed to guerrillas and other armed unidentified people. With the intention of understanding the letter and spirit of the Truth Commission's report, we spoke with one of the three assigned commissioners from the United Nations, former Foreign Minister of Venezuela, Reinaldo Figueredo Planchart. "We put forward our position very precisely regarding the issue of impunity, which is that it is unacceptable, and crimes must be punished and cannot be viewed in light of the actions taken by the government at that time and which were also taken elsewhere". Five days after the Commission presented its report, the Legislative Assembly passed the General Amnesty Law for the Consolidation of Peace, which granted absolute, total and unconditional pardon to those who have committed political offences and repealed all provisions that run counter to the law, in clear reference to the Truth Commission, which constitutes a violation of the peace agreements. Critics of the declaration of the unconstitutionality of the amnesty law, which are both in the ranks of the FMLN government and the opposition, mainly in the ARENA party, raise the banner of fear, forecasting risks of destabilization and social conflicts. The most radical opponents accuse the Chamber of judicial dictatorship or irresponsibility towards the country's future. With crimes against humanity that bypass the legal and social, the situation is similar to what happens with tectonic faults. Apart from the San Andreas, the other tectonic plates, such as the South American, the Nazca, the Cocos, the Caribbean, and the North American, are not visible to the naked eye, but they are there. Sooner or later, they cause earthquakes of great intensity. Similarly to those shifts, the silence that attempts to keep great human tragedies in obscurity causes crises at some point, and this is when the corpses emerge forcefully to the surface. This has happened again and again in history. This is the lesson being vocalised by the Salvadoran bishops, who celebrate the repeal, to ask their compatriots to confront this time maturely and calmly. They are also victims, but the prospect of sending anyone to jail does not enthuse them, "we only ask that the truth is known and forgiveness is sought, so as to immediately offer forgiveness to whoever it may concern. "In the meantime, awaiting justice are Monsignor Oscar Arnulfo Romero, the six Jesuit priests and two women, and at least 12 nuns and priests of the Catholic Church in El Salvador. Things being this way, here may lie a key point to aid in moving away from black and white interpretations, whether it be impunity or revenge. The repeal might be the awaited moment for the truth to come to light, for judgements that do not solely imply prison sentences. It is not sentimentality, victims, as is commonly said, see it differently. They want to be heard, they want to tell of their sufferings. Eduardo Garcia of the Association for the Search for Missing Children describes this, saying that they speak of compensation rather than reparations, because compensation fills the heart, while reparations only fill the pocket. "In El Salvador there is a line of continuity between the criminality of human rights violations and corruption, during the civil war and the situation today. The country currently has the highest level of homicides in the world. That is because there is total impunity and if this is not broken,if there is no examination of the roots of this, and those who continue with criminality from the conflict to now, there is no way for a democracy to exist. A democracy does not exist without a state of law". It is precisely this reality that has been consistently present in the Constitutional Chamber's determination; so says Judge Sidney Blanco. "There is a common trigger in the life of our country and is called impunity. Impunity that has reigned during and in the post-war period for human rights violators, but also impunity for the corrupt. These two things have greatly contributed to the paralysis afflicting the country and citizens' discontent. So if these two evils could be combated, if a response could come properly and forcefully from the judicial system, the people would have a vision, different from the so negative one that they have historically held towards the judicial system". The four judges of the Constitutional Chamber of El Salvador and the counter vote of the fifth, are the result of many considerations, and today, interested speculations. However, no exculpatory or threatening argument will overcome the conviction that the full knowledge of what happened as regards crimes against humanity, far from harming the country, will create an occasion for perpetrators and victims to look each other in the face to hear the other party’s' reasons, and trust in that pious truth will illuminate the path of tomorrow.